Since 2011 Polish Ministry of Sport and Tourism is using AMODIT as a platform to gather applications for financing sport events and builing sport facilities. Number of organizations interested in getting such funds is above 30 000. Most people apply just a few days before deadline so it is every important to ensure high scalability and performance. Applications forms are quite complex and can contain multiple subforms, tables etc. They are all defined using web browser. There are many restrictions defined as rules. So system checks validity of a form before it is sent to Ministry. Forms are sent in electronic format but they can also be printed for archiving purposes. 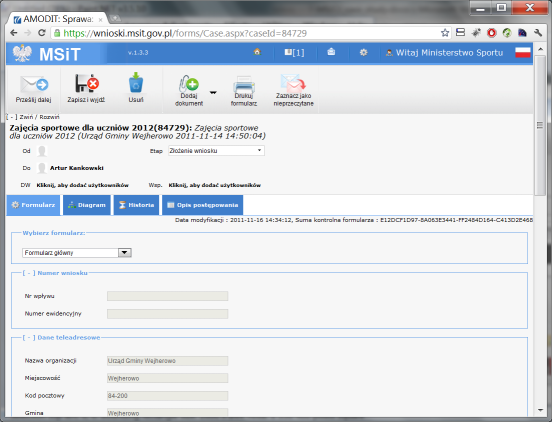 System already supported numerous applying actions with load of over 4 thousand people applying at the same time. tracking history of changes and decisions.